Directions: From Cheras, head towards Kajang and the new Semenyih road to the south. To guide you, the route on this map begins near Tesco Kajang at Saujana Impian. If you are on the right track, another hypermart, Giant Saujana Putra should appear on your left soon after. Info / Insights: Lekas sikit! Of all the Malaysian highways with clever acronyms, LEKAS is not only appropriate but quite funny. It is lekas (faster) by quite a bit. If you are traveling from Cheras to the Ampangan area in Seremban, LEKAS is definitely the way to go. It by-passes the usual congestion on the North-South Highway, especially near the Seremban exits. From Kajang, LEKAS takes you straight to the Jalan Kuala Pilah-Senawang junction. From there, one can easily proceed via the trunk road to Kuala Pilah or Jelebu. If you are old enough, you will remember the trunk road to Seremban takes you through a winding, steep stretch just after Mantin town. LEKAS cuts through this area but via several elevated sections. LEKAS also offers a quick way to get to the back of fast-developing Nilai and Pajam. In the North, the expressway is properly integrated to SILK which connects to Cheras and Sungai Long or to the SKVE to Putrajaya and Puchong, at the other end. It is interesting to note that the rest-stop buildings and toll booths at LEKAS incorporate a unique, stylised Minangkabau roof design, popular in Negeri Sembilan. 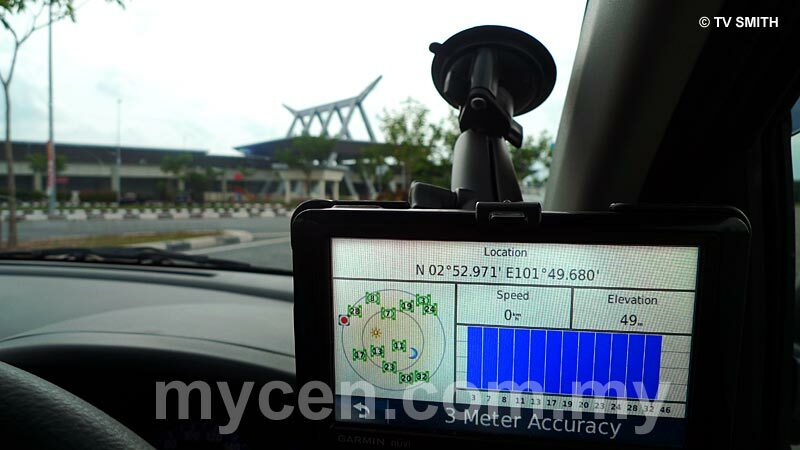 Trivia: Picture above shows my Garmin 1460 GPS getting a full satellite constellation at the Beranang rest area on LEKAS. My other GPS, the Garmin 60CSX showed an accuracy of +/- 2m for most parts of the highway. For mapping runs, I use an external Garmin roof-mounted antenna connected to a San Jose Navigation (Sanav) active re-radiating helix transmitter inside the car.